Mie University | JICA Volunteer Seminar was held. JICA Volunteer Seminar was held. 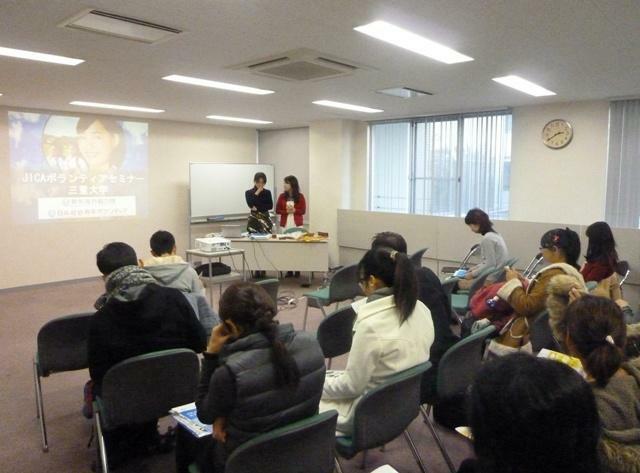 On December 11, 2013, JICA Volunteer Seminar was held at the CIER Conference room. We invited Ms. Mao Morimoto who is a graduate of Mie University, and was working as a JICA volunteer from June 2011 to June 2013 in Paraguay. She shared her great experiences during her volunteer work and activities after returning to Japan. This seminar provided a wonderful information to whom interested in international cooperation activities.